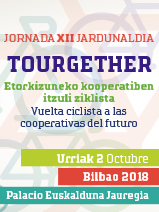 FOROKOOP, born of shared concern between the Higher Council of Basque Cooperatives (CSCE) and the Basque Cooperatives Confederation (KONFEKOOP) related to the need to reflect on cooperative issues, both theoretical and practical application. When we weigh up the idea of creating this "Cooperative Debate Forum", we consider traditional models –face to face forums on specific aspects of cooperativism-. We also thought of the convenience of incorporating new technologies as a tool to achieve a time permanent discussion forum. We propose, in short, a mixed model, on and off line. This allows us to combine an annual "in person forum", which analyzes specific issues related to our cooperative world and the social economy, and a "virtual forum" on line, for permanent discussion. Forokoop is open to all people interested in cooperative issues in order to contribute to mutual knowledge and debate and exchange of opinions, proposals and reflections. Forokoop born with a modest approach, within the Basque cooperativism; but we are also aware of the responsibility we hold as a benchmark of global cooperativism. We´ll try to answer to this challenge since, these tools we want to use, new technologies, reach all corners of the planet. From here we invite you to cooperate, to share in this forum, to present your concerns and reflections, your suggestions and your criticisms.